Chris Parker and I got up on this sunny summer morning and after packing, we checked out of the Huntington Motor Inn. We made a stop at Sheetz for some breakfast then drove US 22 east to Mt. 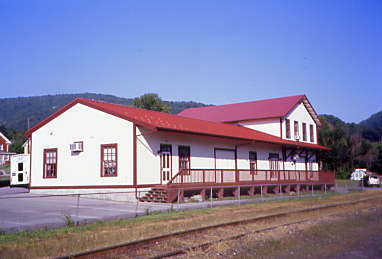 Union. 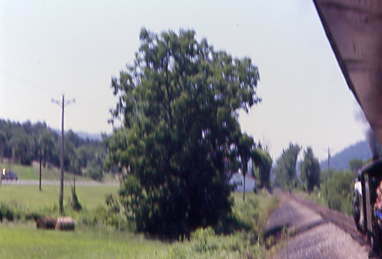 We drove into town and saw a wooden railroad cross buck. We turned left on the street before it and drove east about six blocks. 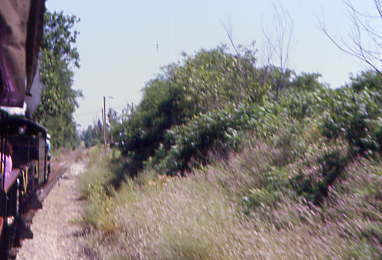 We turned right and at the tracks, I had Chris stop the car. 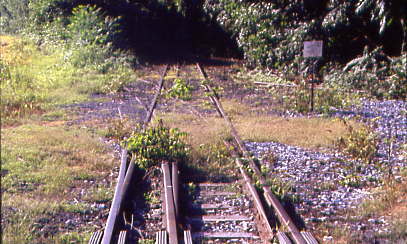 The reason we stopped was because we found the former dual gauge track shared by the East Broad Top and Pennsylvania Railroads. Chris needed a few things so we made a stop at Safeway. 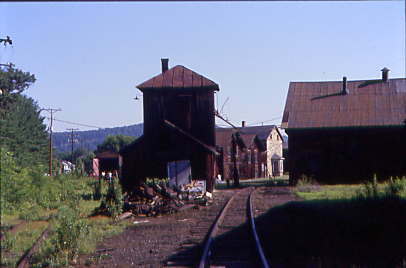 After that, we decided to find what else might be left railroad-wise in Mt. 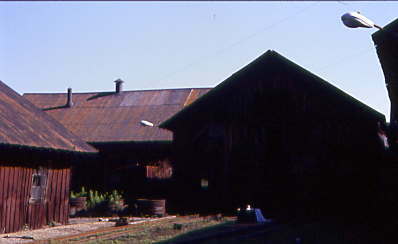 Union. 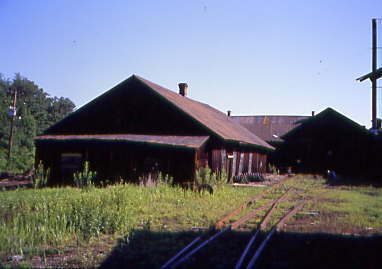 We drove west along the tracks and found a very interesting building. 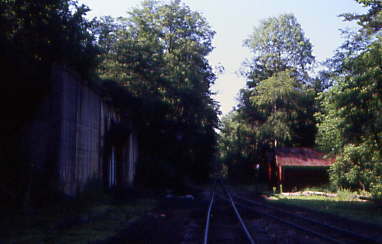 What we found was the East Broad Top Railroad station. 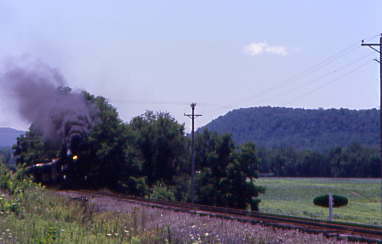 With that done, we decided to head towards Orbisonia by taking PA 7474 south. 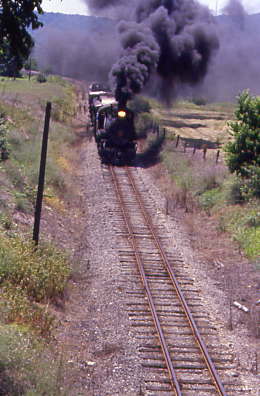 Oops, wrong highway as there was no railroad grade running up the valley. We back-tracked into Mt. 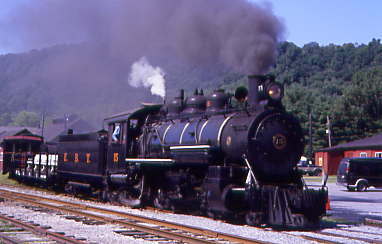 Union then found US 522. 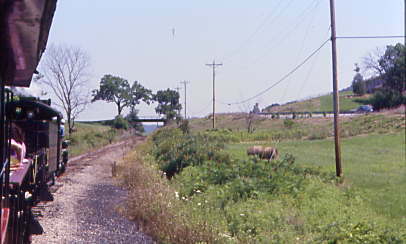 As we headed south on this road, the East Broad Top Railroad tracks still exist in many locations. 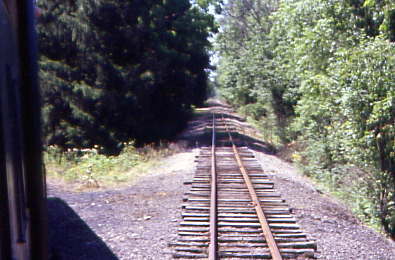 After Shirleysburg the tracks of the East Broad Top Railroad came into view and it all looked familiar to me from seeing all the videos of this railroad over the years. 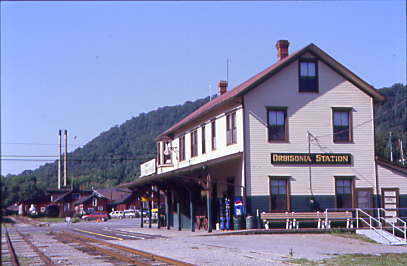 We drove through Orbisonia and soon found the Orbisonia Station of the East Broad Top Railroad and parked the car in their parking lot. 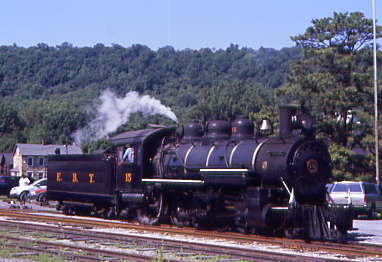 East Broad Top 15 coming onto the turntable. 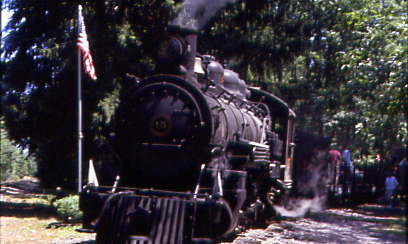 We walked over to the roundhouse where we found East Broad Top 2-8-2 No.15 coming out onto the turntable for the day's activities. 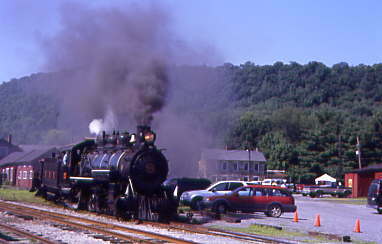 After photographing it, I met Stanley Hall, General Manager of the East Broad Top Railroad. 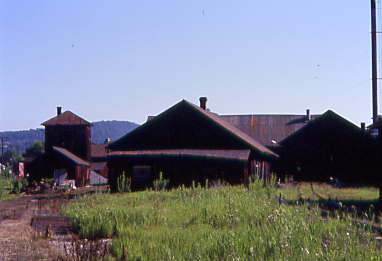 After I introducing myself, he said we could look around the property all we wanted. 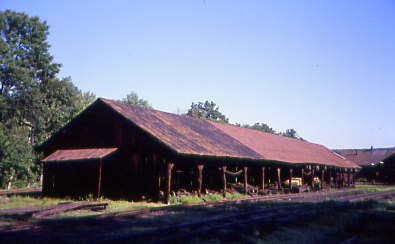 This is a very well-preserved railroad and the remaining buildings are fantastic to see. 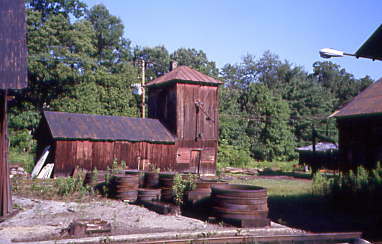 Water Tower and Sand House. 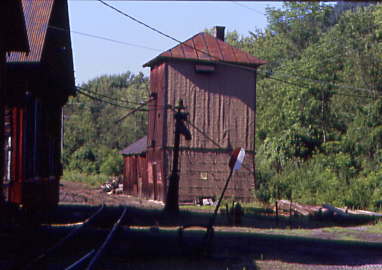 Side view of Water Tower and Sand House. 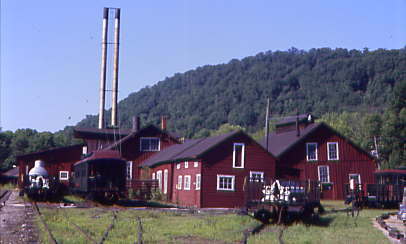 Water Tower and Machine Shop right and to the left the paint shop. 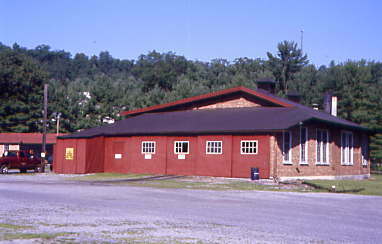 Carpentry Shop and Machine shop. 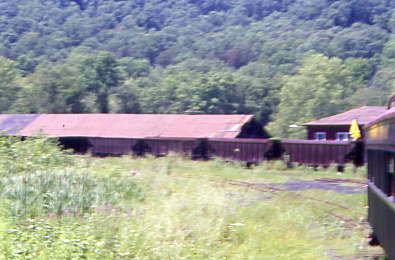 Car shop with EBT hopper cars in this view. 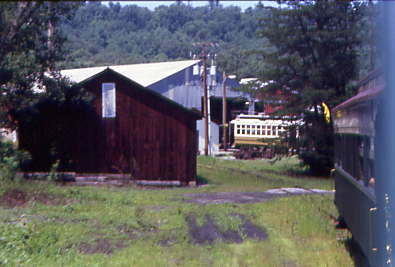 EBT Passenger Coach and Electrical Shop. 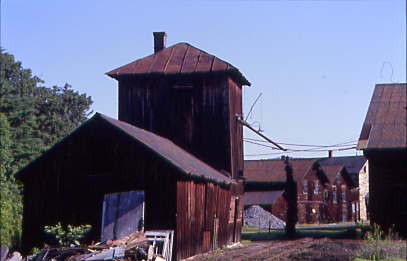 Electrical Shop and Blacksmith Shop. 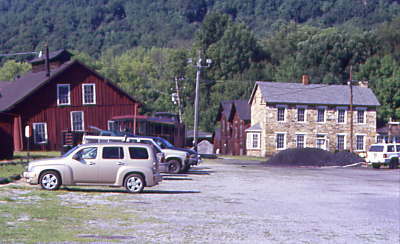 Superintendent's Office and Blacksmith Shop. 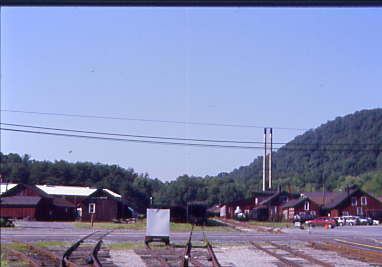 Across the road is Orbisonia Station, home of the East Broad Top Railroad where one purchases their tickets for the trips. 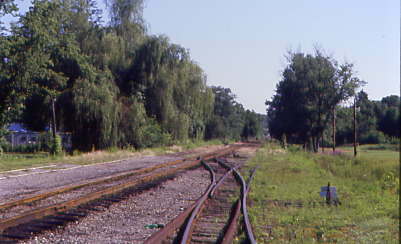 The EBT Tracks north of the station. 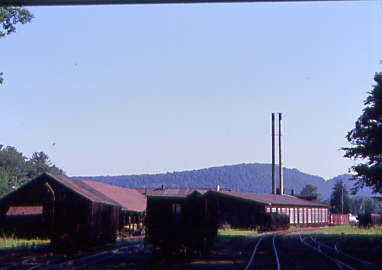 The view looking south back towards the yard. 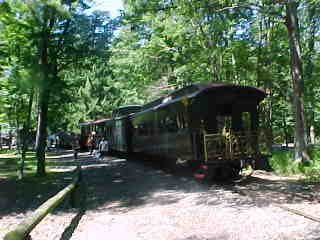 The Rockhill Trolley Museum brought out their car for the runs for the day. Chris and I walked over there as they were expecting us. 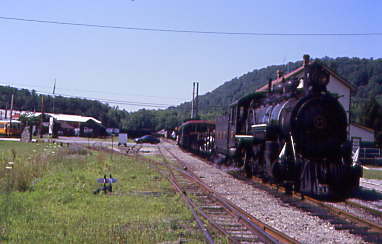 This story will be the next one above this one so while we took a tour of the car barns and a ride, you can enjoy the brief history of this line. 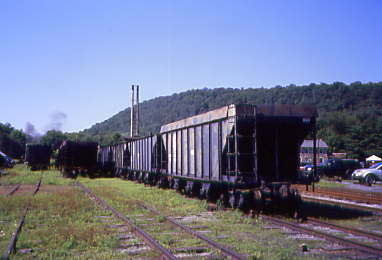 The East Broad Top Railroad and Coal Company was chartered on April 16th, 1856 to mine and transport coal from the Broad Top Mountains. 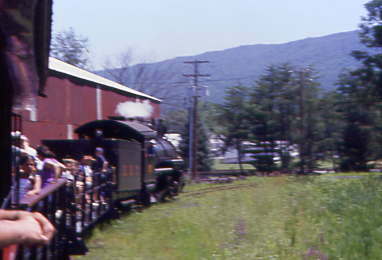 It was built as a narrow gauge line from Mt. 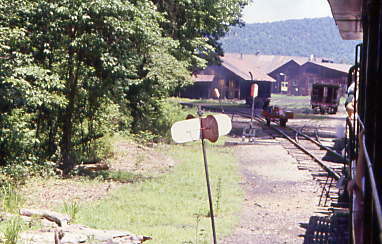 Union to Rockhill Furnace on August 30, 1873. 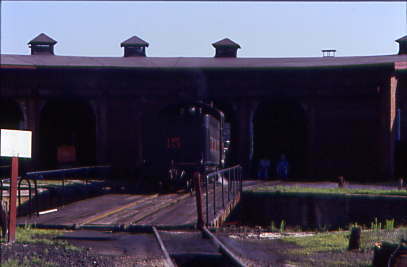 It was extended south to Robertsdale in 1874 then onto Woodvale in 1891. 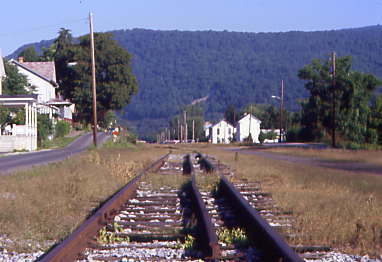 The narrow gauge line connected to the standard gauge Pennsylvania Railroad in Mt. Union. 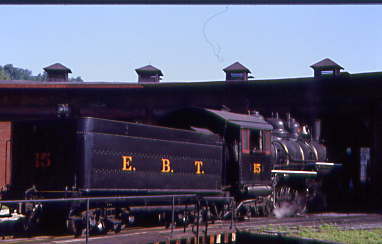 In 1919 the EBT was purchased by the Madeira, Hill & Company which lasted as owner until it went bankrupt in 1938. 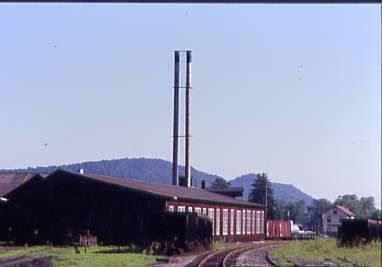 The company was reorganized into the Rockhill Coal Company which operated the railroad until the end in 1956. 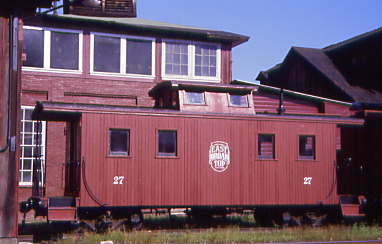 At that time it was the last narrow gauge railroad in the United States east of the Rocky Mountains. 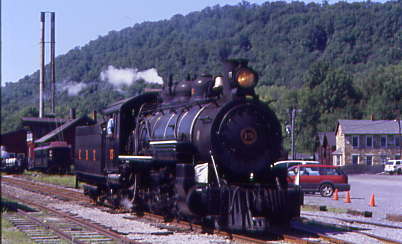 The Kovalchick Salvage Company of Indiana bought the railroad and in 1960 passenger service was returned. 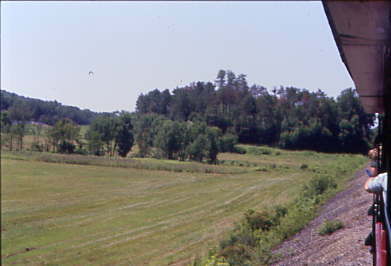 The East Broad Top Railroad was declared a National Historic Landmark in 1964. 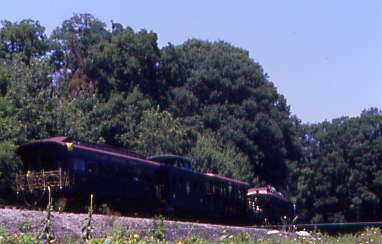 In 1983 the Friends of the East Board Top Railroad was formed to document, preserve and restore the East Broad Top. 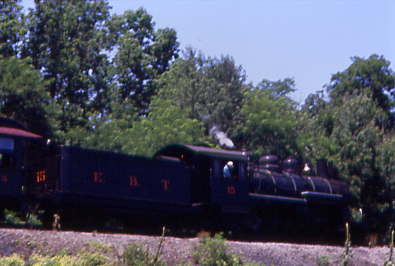 The East Broad Top Railroad remains one of the most complete and authentic narrow gauge railroads in the United States. 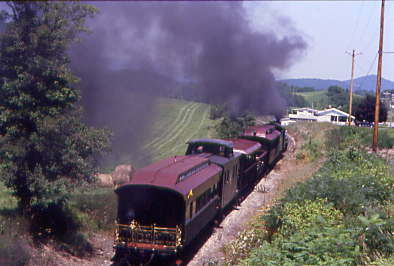 After our tour and ride over at the Rockhill Trolley Museum, we walked back to the East Broad Top Tracks and I spotted smoke. 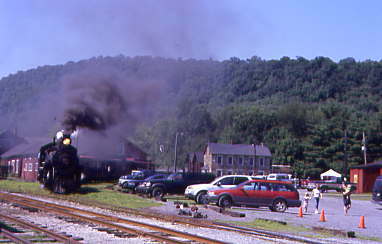 EBT 2-8-2 15 came down the mainline, pulled by us and waited to throw a switch before reversing to make up its train. 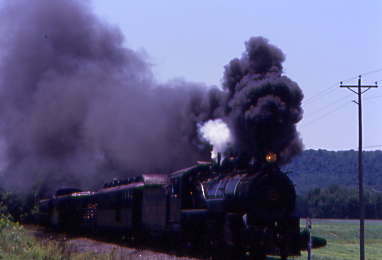 The EBT 15 pulled by us, waited to throw a switch then would back to make up its train. 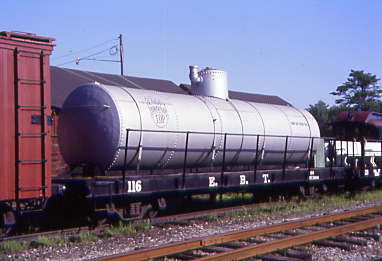 EBT 15 backing by me. 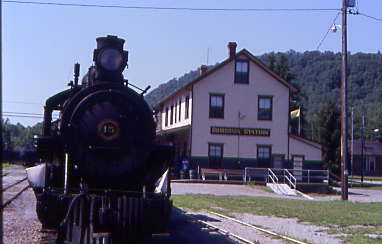 With the train made up, EBT 15 then pulled into the station. I went into the station and bought a ticket for Chris and used a free Internet coupon I had printed for my ticket. 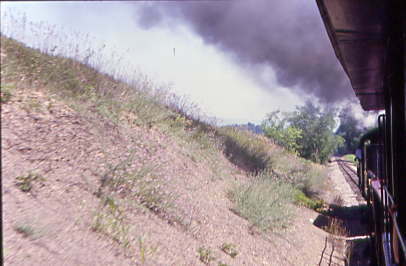 I purchased a pair of seats in the covered open car so we could avoid the cinders. 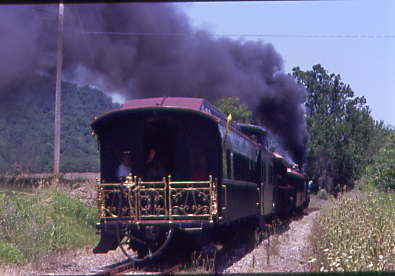 Our train consisted of EBT 2-8-2 15, Open Car 117, Open Car 119, Covered Open Car 175, caboose 28 and Parlor car 20. We took our seats on a bench in the 175. 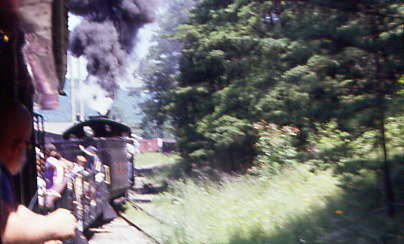 After a few minutes, I detrained for a few more pictures, met our engineer, gave him my business card and told him that we would be chasing the 1:00 PM departure. He said he would be sure to look for me. 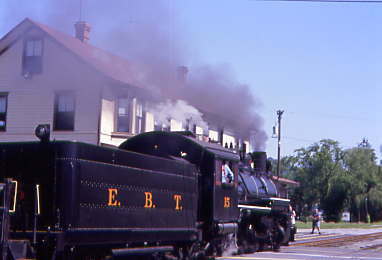 I returned to the EBT 175 and sat down. 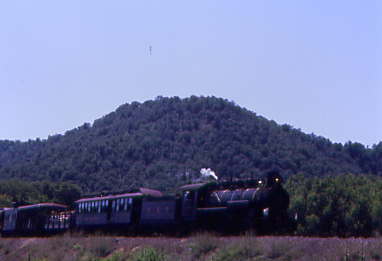 An elderly couple was late arriving and with the train about to depart, they had no place to sit. Chris and I gave up our seats for them and we both would stand at the end of the car for the whole trip. 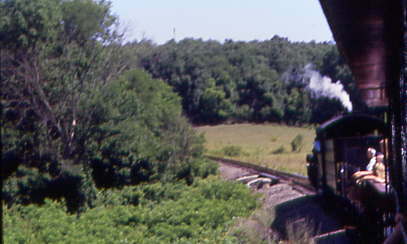 After all these years I was finally going to be riding the East Broad Top Railroad, one of my goals in my railroading life. 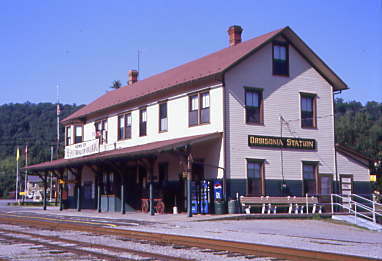 At 11:00 AM, EBT 15 blew its whistle and with that we started rolling away from the Orbisonia station. 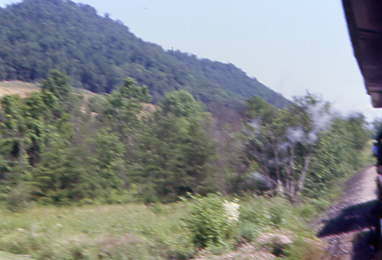 We headed north crossing Black Log Creek. 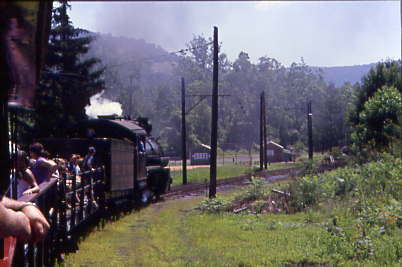 Once out of town, we started seeing the Pennsylvania countryside that this railroad is known for. 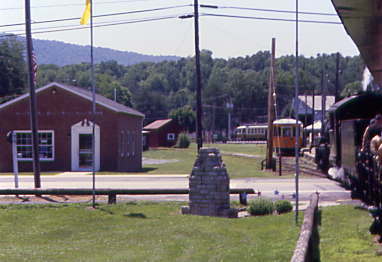 We passed the railroad crossing sign at the first crossing north of town. 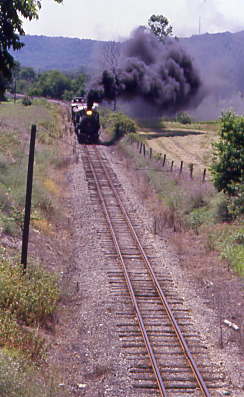 Our train took a slight curve. 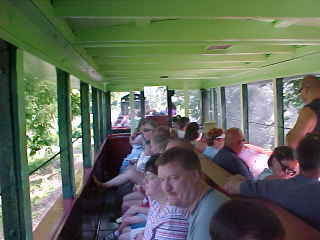 Passengers were enjoying our covered open car. 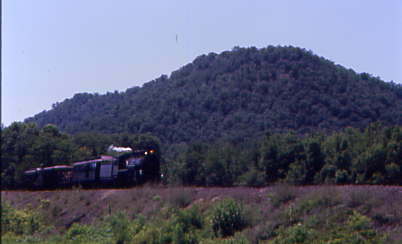 A nice little hill in this view. 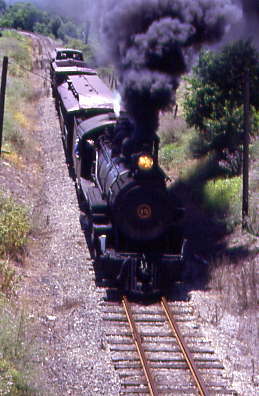 The train curved to the famous bridge that many photographers have used over the years. 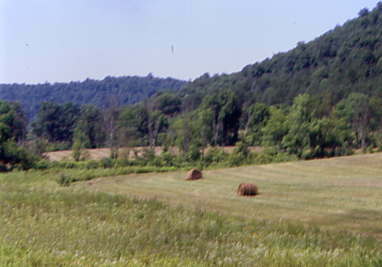 A couple rolls of hay in this field. 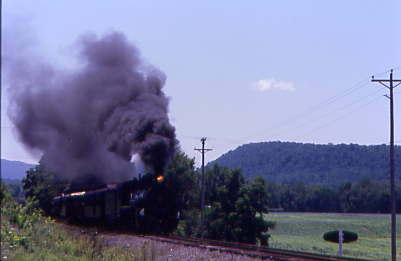 Trails of smoke as we took another slight curve. 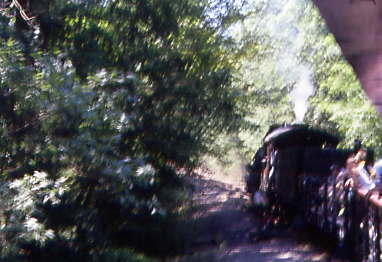 The train crossed a bridge over a farm road before approaching the wye running into the forest. 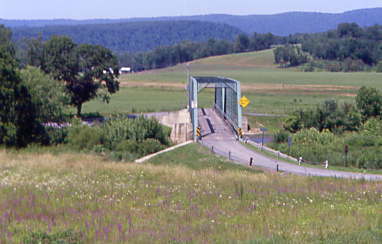 Off of that bridge a great looking scene looking west. 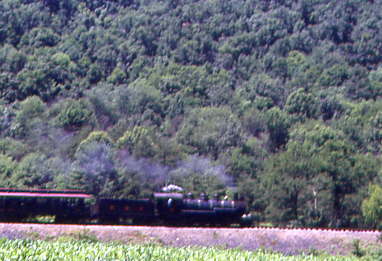 A few minutes later, we arrived at the wye. 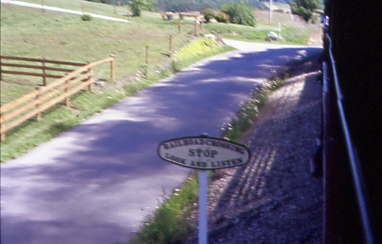 Once we passed this switch, we would back down this leg of the wye. 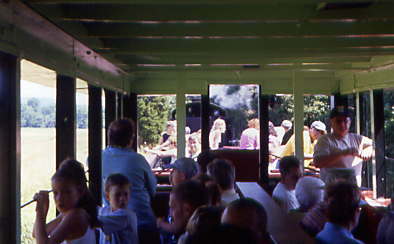 Passengers enjoying the covered open car. 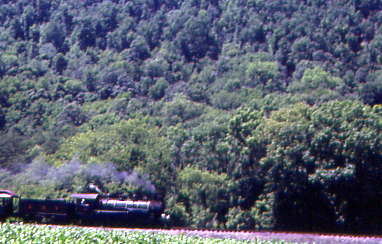 Here the Parlor Car led our train down the leg of the wye. 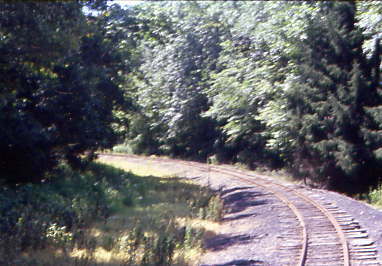 This view shows the track we arrived on. We continued to back down the wye. The EBT 15 ten took us ahead to a picnic area on this leg of the wye. Here we could get out for ten minutes which I did for more pictures. 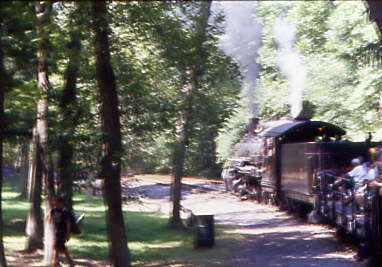 Our train at rest at the wye. 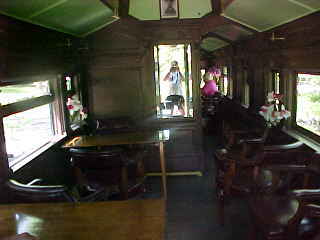 The inside of the one end of the Parlor Car. 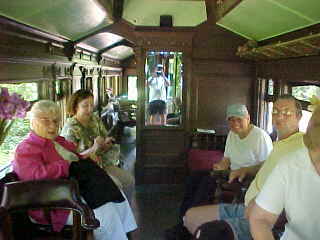 I got caught in the mirror taking this picture of the other end of the Parlor Car with some happy passengers aboard. 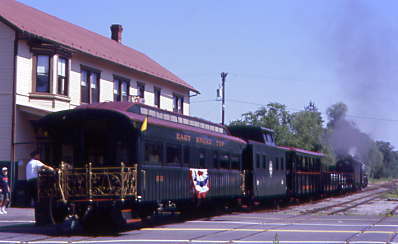 The Parlor Car at the rear of our train at the wye. All the passengers reloaded, and we started back towards Orbisonia. We passed many a field on this trip. 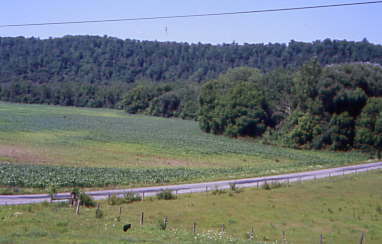 The corn field that will come into play later on this day. 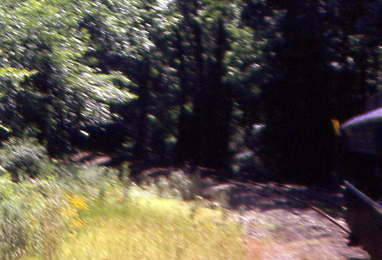 A slight curve by a tree. 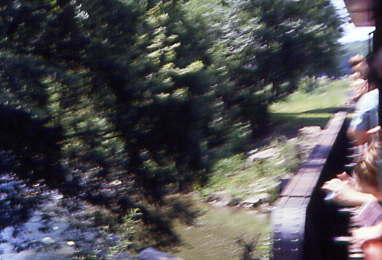 Crossing the bridge over Backlog Creek. 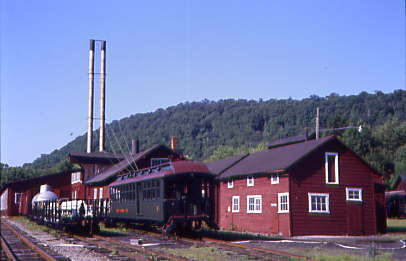 Back at Orbisonia we entered the Rockhill Trolley museum and started around the wye on duel gauge track with the Trolleys waiting until we are finished before they start another one of their trips. 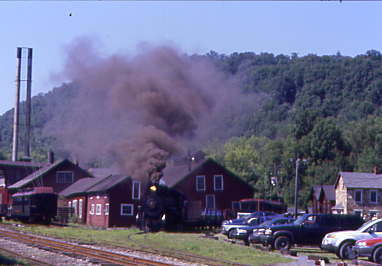 Steam engines under trolley wire does not happen every day in many places, does it? 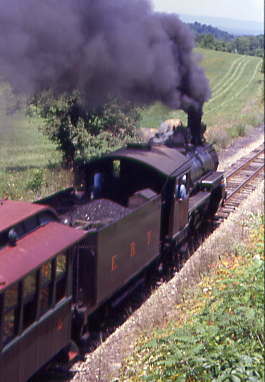 Once we had pulled passed the switch, we started backing around the other leg of the wye. 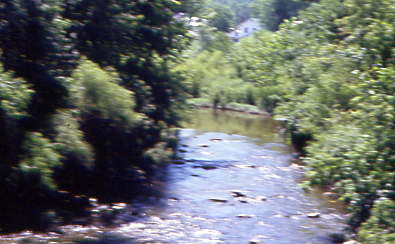 The EBT 15 is pushing around this leg of the wye. 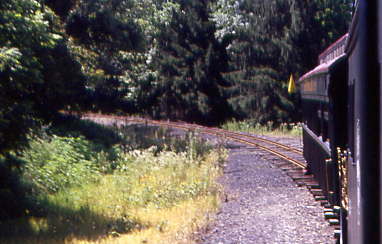 The Parlor Car nearing the mainline. The EBT 15 still pushing. 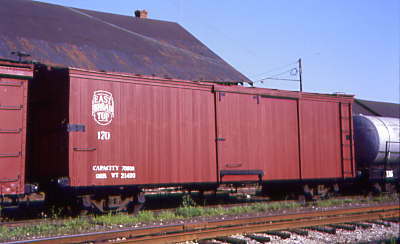 Our covered open car now has reached the mainline. 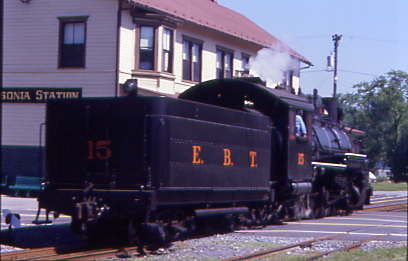 The EBT 15 has almost reached the mainline itself. I thanked all of our crew members before visiting the gift shop for a T-shirt. I went looking for something to eat on the two properties while Chris Parker shopped. We had no luck and Chris had to get cash since the East Broad Top does not accept credit cards. We went to a market that had a Subway then went to a bank so Chris could get some cash. 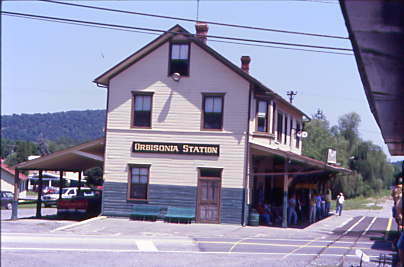 We returned to the Orbisonia Station where Chris bought his souvenirs before we left to get to our first photo location for the 1:00 PM departure. 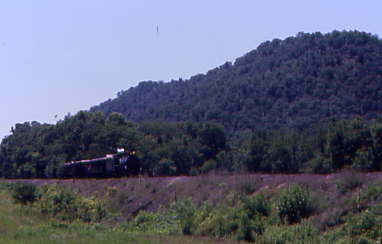 Chris and I enjoyed our Subway sandwiches on US 522 opposite the first grade crossing north of Orbisonia. 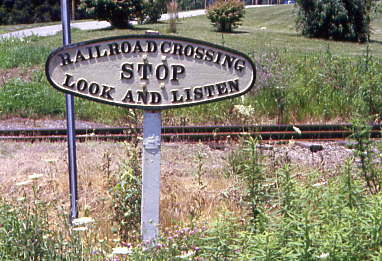 They have a unique railroad crossing sign that protects the grade crossing. From the bridge we had great pictures of the train. Then it was back into car to the next spot. 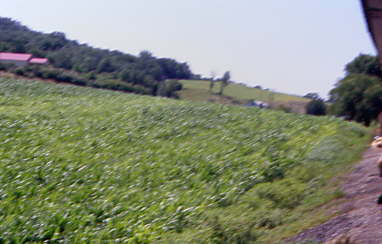 As we passed that corn field, I had Chris stop and we walked across the highway for the next pictures. 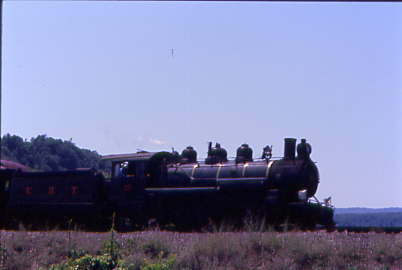 After these side pictures, we drove to the farm road for the last passing of the EBT train for the day. 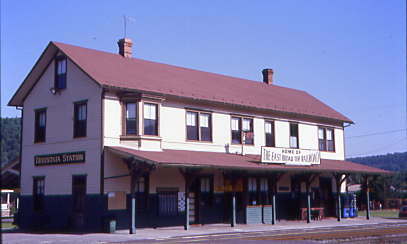 The final pictures of the East board Top Railroad. 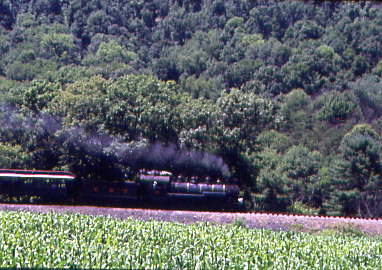 Following what I would call excellent chase and Chris Parker's first chase of a steam train, it was now time to say goodbye to the East Broad Top Railroad. What a great time we had here. 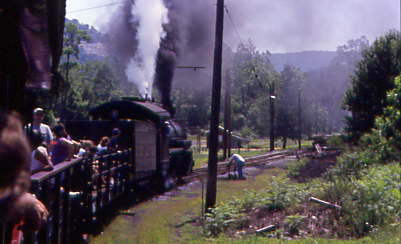 Now we would drive back to the Horseshoe Curve and then to the Tunnel Inn for the night but that is another story.